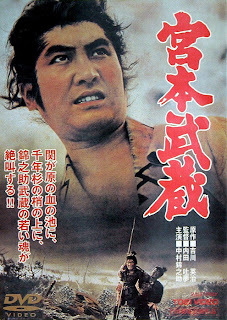 In 1954 Toho had its go adapting Eiji Yoshikawa’s mammoth serialized fictional account of the life of the world’s greatest samurai, Miyamoto Musashi. Toho’s samurai series was popular internationally, and here in the West is the best known adaptation of the book. However in Japan, the best known, and by far the most faithful adaptation of the novel is Toei’s series made a decade later by Tomu Uchida. The first part of the five film series, "Miyamoto Musashi" aka "Zen and Sword" basically covers the same ground that Hiroshi Inagaki’s "Samurai 1: Musashi Miyamoto" covers, albeit in far more detail. Its interesting to note that Inagaki’s 3 part series has run times of 93, 104 and 105 minutes respectively, while Uchida’s 5 part series has run times of 110, 107, 104, 128 and 121 minutes. Its obvious from these statistics that Uchida’s series will be more faithful in adapting the 4000 page series which was serialized in Asashi Shimbun starting in 1935 (over 900 in the abridged English version). The wild Takezo and his equally aimless friend Matahachi find themselves on the losing side of the battle of Sekigahara. Instead of making a name for themselves by beheading a general, Matahachi is wounded by an arrow, and is unable to return home. The two spend time with Akemi and her mother Oko, a mother and daughter team of battlefield pillagers (much like the mother and daughter in Onibaba). Oko becomes enamored with both Takezo and Matahachi, but after a run in with local brigands, Takezo finds himself on his own, whilst Matahachi leaves with Oko and Akemi. Takezo returns home to inform Otsu, Matahachi’s fiancé, that her husband will never return, however Takezo is a wanted criminal, and is greeted with anger and hatred. He terrorizes the town; even after a local samurai lord and his men are charged with brining him to justice. Only the local monk Takuan seems to be wily enough to capture Takezo and make him see the error of his ways. There is a clear difference between this film and Inagaki’s. This is the contemplative exercise in human existence that it should be, whilst Inagaki’s is a shorter, watered down version. Uchida has created a nuanced and philosophically charged film that contains some incredible cinematic marvels. All the characters are more fleshed out, Inagaki creating two-dimensional caricatures of the three-dimensional beings Yoshikawa created, and which Uchida emulates to perfection. Akemi and Osugi appear far more sympathetic in Uchida’s film, and Kinnosuke Nakamura’s performance is filled with the wild, animalistic energy that Takezo deserves. He was also a few years younger than Toshiro Mifune when he played the same role, but the difference in age seems more exaggerated. Kinnosuke is far more believable as a 17 year old than Mifune. Mifune, while still good in the role, just doesn’t capture the ferocious nature that personifies Takezo before he begins his journey. There are some truly stunning long takes with some spectacular stage work, and as the film progresses they escalate in their marvels, culminating in some spectacular cinematic wonders during Takezo’s forced education in the tower of Himeji. It’s a surprisingly powerful ending that substantially expands on what Yoshikawa wrote whilst remaining very faithful to the material. Which is the big difference between this film and Inagaki’s. Uchida creates a rich, textured film that understands the material at a level Inagaki cannot match. Whether is the bizarre sexuality that pervades the screen as Oko clears Matahachi’s leg wound orally with some shochu, Takezo’s brutal beating of the brigand leader with his bokken, or the climatic bleeding walls and sunrise on Takezo’s life, Uchida fills each scene with a unique sense of wonder. Don’t get me wrong, I do enjoy Mifune and "Samurai 1", however this film is on another level, and makes me want to watch the rest right now.